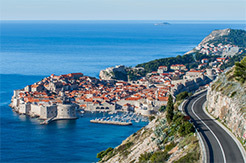 There are many events in Dubrovnik in which everybody can find something for himself. But, behind all those events, in summer in Dubrovnik just a walk on Dubrovnik main street - Stradun is sort of event. Here you will see many street players, dancing groups, people who do acrobations, performances - all these things make Dubrovnik one of the most beautiful and most visited tourist destinations. We chose for you the most attractive events during the year:. After the strong earthquake, inhabitants of Dubrovnik escaped on Ragusium, small rock. Living conditions there were really bad and hard, forest on one side, the sea on another ... But they worked hard and they managed to make some better living conditions. But, their neighbours, Venetians, were really jealous and saw them as competition. Finally they decided to attack and subdue them. They entered to Gruz and on the island of Lokrum (the parts of Dubrovnik) telling the people that they just came to get some food. In fact they wanted to conquer Dubrovnik. But then, help came from the sky- from St. Blaise. The priest Stojko was praying at the church when St. Blaise has spoken to him and told him about the intention of Venetians. So, he actually ruined their plan of conquering Dubrovnik. 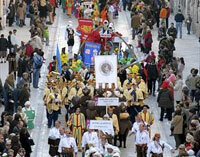 From that day, people are celebrating the St. Blaise as their protector and on February 3rd is his day. The whole festivity in the city of Dubrovnik last for few days. On the opening day, February 2nd you can enjoy in a really very special view- you can see how Dubrovnik's bishop is letting the white pigeons to the sky and, if you find yourself in Dubrovnik, don’t miss this event. You can also see people carrying the banners. This is one of the most interesting moments on the whole Festivity. Also very popular is ceremony called ''Grlicanje''. This ceremony is performed to protect people from various throat diseases. The priest put two crossed candles on the throat. This ceremony happens every year on February 2nd. For a few days in February or March (depends of the Easter), the city of Dubrovnik lives in some other world thanks to many masks and events during the carnival. One of the most popular moments in this period is day when in Dubrovnik comes a large group of people under the masks called ''Zupski karneval'' . Then you can enjoy in a crowded Stradun, lots of laughing, dancing and singing, many various masks and this is the best way to, just for a moment, be someone else, mask to someone or something you always wanted to be. During the spring you can enjoy in amazing sounds of classical music in beautiful and very special atmosphere of Rector's Palace. 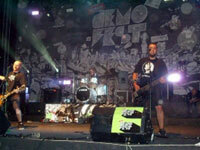 There are presented many prominent artists and some new musicians from Croatia and from the world. As well as presenting the pieces of classical music tradition, the series also opens its stage for new works as well as traditional music. Special atmosphere will give you The Atrium of Rector's Palace. Very famous and very interesting event which happened in Dubrovnik during the summer period is Libertas film festival. Many of independent produced movies and documentaries are being shown and the best one gets a special award. The film rated best from the audience receives a special audience award. The showings are held in Cinema Sloboda in Dubrovnik, the Marin Drzic Theater, the summer cinema Jadran and at Fort Revelin. 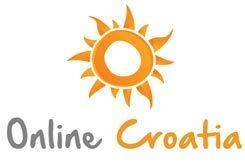 The most famous and the most visited event in Dubrovnik is Dubrovnik Summer Festival. This manifestation which is known all around the world lasts from July 10th till August 25th. for more then 60 years, from 1950. The Festival opening night is ''Dubrovnik night'' when the costumed actors symbolically seek the permission of the Dubrovnik duke to enter the City. This scene is accompanied with the Hymn to Freedom and all that happens in front of the Sponza Palace. On that night the whole city, citizens and numerous tourists participate with songs and dance until the early morning hours. During the Festival the whole city of Dubrovnik is a big stage where top national and foreign artists carry out the plays and musical works of important national and international writers and composers. During the summer period in Dubrovnik you can enjoy in many concerts, projections, exhibitions, shows and musical programs organized by the Association of Orlando Youth. Every year in September in Dubrovnik is being held one of the most famous festival in the world Julian Rachlin and Friends. This festival of chamber music is being held in atrium of Rector's Palace since the year 2000. Julian Rachlin is famous violinist and violist and he plays with many world renowned musicians. This festival is visited by many famous celebrities from all over the world, so there were Kevin Spacey, Roger Moore, Tom Cruise and many others. If you visit Dubrovnik during the September you can enjoy in rare opportunity to hear music seldom performed, from the Mediaeval times and the Renaissance to classical period. This whole festival is being held in amazing atrium of Rector's Palace and this program will allow you to have really memorable experience of Dubrovnik and its history. Saint Nicholas is protector of children and seamen. But, for the citizens of Dubrovnik the day 6 December when Saint Nicholas is celebrated, means the day of the strongest Serbs aggression in war in 1991. On that day, despite the hard damages and loss manage to defend Dubrovnik. In Sponza Palace you can visit memorial room of killed Dubrovnik's defenders and this is one of the most visited museums in the City. There you can see many photos of the attack on Dubrovnik, pictures and life stories of killed defenders of Dubrovnik. During the December in Dubrovnik in atrium of Sponza Palace is being held numerous manifestations called Christmas fair. It begins on Saint Lucys day 13.12. Christmas in Dubrovnik is really special experience which you cannot have anywhere else. The whole City is tasselled, decorated and really amazing. The most gorgeous feeling create decorated City Walls which, like in some fairy tale, take you to the past, to far history and return you to Renaissance Dubrovnik. 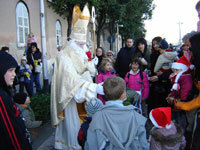 Programs in front of the Saint's Blaise Church are being held during the whole Christmas time - various concerts, dancing groups, children ensembles and, of course, Santa Claus. There is also a special program for children as story-telling, fairy tales, recitals, songs... And all of you can enjoy in entertainment with famous bends from Dubrovnik and Folklore Ensemble Linđo. New Year's Eve on Stradun is really spectacular. Celebration in the year 2001. in Dubrovnik was placed in the group of top 10 destinations in the world for New Year celebrations. 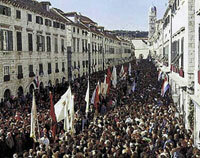 On the night from the year 1999. to 2000. on Stradun was 30 thousand people. 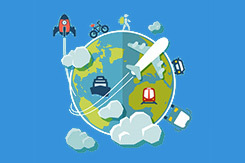 A rich program is organized for day before, but also for the first day of New Year, 01.01. 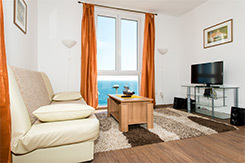 Also, in many Dubrovnik hotels you can enjoy in New Year's Eve with many popular Croatian stars. 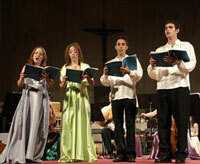 Dubrovnik Symphony Orchestra is professional music orchestra of Dubrovnik. 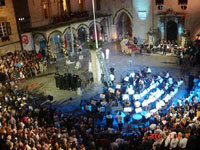 Orchestra performs during Dubrovnik Summer Festival, in New Year Eve but also during the whole year. Concerts during the summer are being held in atrium of Rector's Palace and during the winter in Revelin fort. Concerts of Dubrovnik Symphony Orchestra are visited by numerous tourists who come to enjoy in various great pieces played by this great orchestra, well known in the whole world. Folklore Ensemble Linđo has been performing for already 40 years and because of it, the name of the city of Dubrovnik today is famous in Germany, Italy, Greece, United Kingdom, SAD and Japan ... Linđo is the most popular dance of Dubrovnik, danced to the accompaniment of the old South Dalmatian instrument with three strings, called lijerica. Linđo is characteristic dance of the city of Dubrovnik and Dubrovnik' area. Today Linđo is a symbol of Dubrovnik, something that makes this city well known and famous in the whole world.